I've been using Insync for nearly a month now and I have come to a conclusion that Insync is definitely the Google Drive alternative client for me. I seriously can't live without my cloud syncing. Everywhere I go, I can instantly access my personal files, pictures, and documents from my smartphone or laptop. For those who are unfamiliar with the concept of 'Google Drive' and 'cloud sync', let me try and explain it in a few simple sentences. Google Drive is a cloud storage provider, that is, storing your files to Google's servers as well as locally on your computer. Whatever changes you make to your local files within that 'Drive' folder, it would be reflected (and uploaded) to the 'cloud'. The benefits of using cloud storage means that you able to easily recover your files if your laptop/smart device gets damaged or stolen. You are also able to access your files from anywhere on any supported device (whether that would be your smartphone or laptop). Now Google Drive does offer their own syncing client (a piece of software that sits in your taskbar and downloads/uploads any changes you make to your documents) but it is really limited to basic syncing of your files. Insync is an alternate client to Google Drive which does a whole lot more. 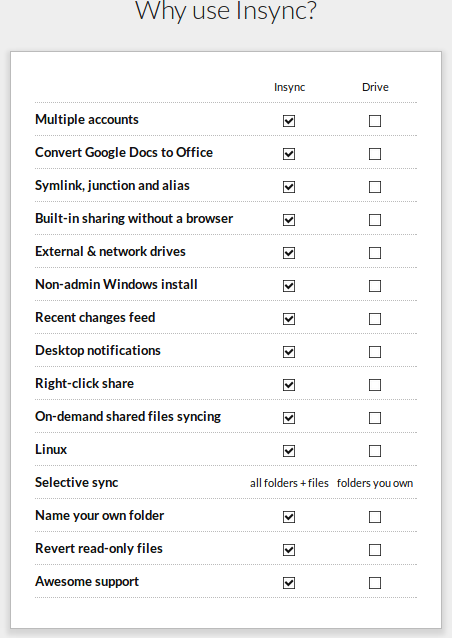 For example, with Insync, you are able to sync multiple Drive accounts to your computer. I found other features such as Recent changes feed, desktop notifications, and selective sync extremely handy for my Drive usage. Insync Plus (the cheapest plan) is free to try out for 30 days, after that, it is only a $15 one-off fee for one Google Account. If you want multiple account support, then you will have to go for the Insync Pro plan which is $15 a year for 3 Google Accounts. If you want to add more Google Accounts, it's another extra $5 added on. With Insync Pro, you also get a handy dashboard which displays stats of your Drive usage. Lastly, Insync has multiple platform support (something Google Drive lacked for the Linux platform). Insync has clients for Windows, Mac, and Linux with additional support for Android and Windows Phone. 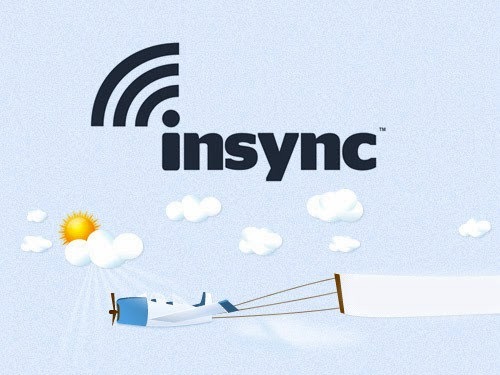 Give Insync a go if you are an avid Drive user. You won't be disappointed and it's definitely worth the $15. You can check out Insync's website for more info!